A ten-billion-dollar deal aims to create the world's largest exchange company. The plan would combine the operators of the New York Stock Exchange and Germany's Frankfurt Stock Exchange. The two companies, NYSE Euronext and Deutsche Borse, announced the agreement Tuesday. Deutsche Borse shareholders would own about sixty percent of the combined group. One thing it still needs is a name. The new company would have headquarters in Frankfurt and New York. The New York Stock Exchange is the world's most famous stock market and a symbol of American capitalism. Treasury Secretary Tim Geithner says New York will remain at the heart of the world's financial system for a long time to come. But the exchange business has changed in these days of high-speed trading by computers in a globally connected economy. The Big Board now has to compete with smaller exchanges. Where stocks are traded has become less important than how much those trades cost. NYSE Euronext and Deutsche Borse had profits of almost four and a half billion dollars last year. They expect to save four hundred million dollars a year by combining their operations. These savings could lower the cost of stock orders. But the size of the company could raise concerns about competition in the exchange industry. The new company would also have trading operations in Britain, France and other European countries. Stock trading and other financial services would remain important to the combined company. But much of its income is expected to come from trading complex financial products called derivatives. The deal requires approval by American and European officials and by shareholders. Other exchange operators, like the CME Group, could try to offer a higher price for NYSE Euronext. 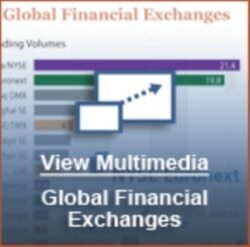 The CME Group, operator of the Chicago Mercantile Exchange, is one of the world's largest traders of derivatives. Duncan Niederauer, chief executive of NYSE Euronext, is expected to keep that job in the new company. He says combining with Deutsche Borse will make the company more competitive. DUNCAN NIEDERAUER: "This not only creates the world's premier exchange group, but there's a word we all want you to focus on today, and that is diversified. This will position us to compete on what is increasing a global landscape in a very competitive industry." Last week the operators of the London and Toronto stock exchanges announced a deal to combine their companies. And the Singapore Exchange offered in October to merge with Australia's exchange.